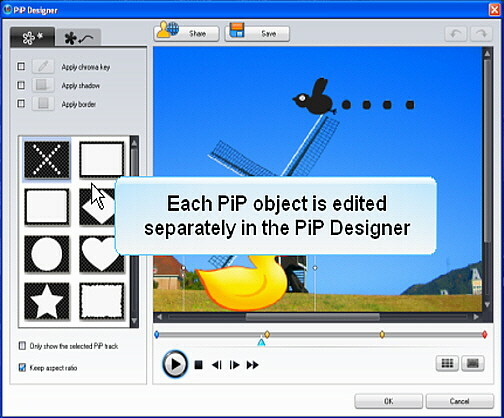 PowerDirector 7 is also the first open video editor that allows users to share and download custom designed PiP effects, animated objects and DVD templates from Directorzone, the community website for video editors. 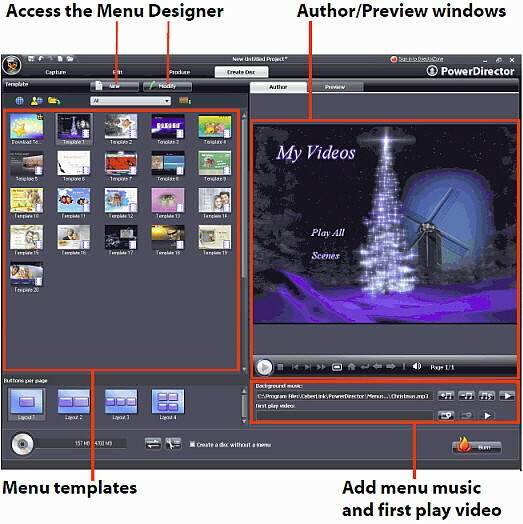 PowerDirector 7 is powerful video editing software featuring easy-to-use features for enhancing users’ videos and producing polished video and slide show productions. Power Director 7 handles today’s popular 16:9 and 4:3 aspect ratio projects but you will have to set the desired ratio before starting to work. 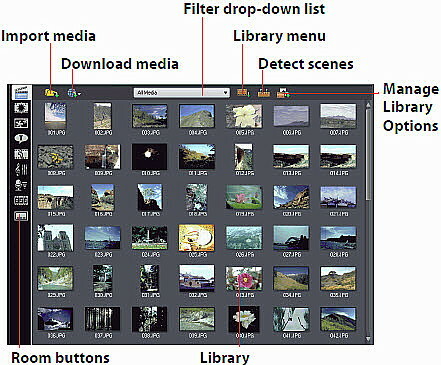 Power Director 7 Ultra includes some very interesting artistic effects including versatile picture in picture (PiP) designer to resize, reposition and add borders to picture-in-picture clips. 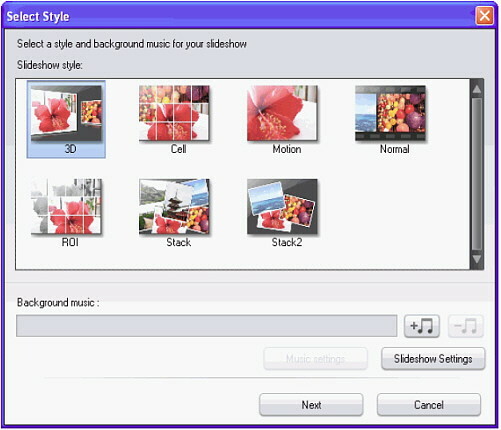 Edit videos and slideshows automatically with stunning titles, effects, and transitions Quickly fix and improve videos with magic enhancement tools Achieve the results you want with advanced editing features including key frame PiPs and menu editor Import from high-def camcorders to create high-def movies Publish directly to the web on Streamload or YouTube. Edit videos and slide shows automatically Quickly fix and improve videos with magic enhancement tools Express your creativity with over 300 effects and styles Import high-def video content, including the AVCHD format. Additional editing enhancements include improved performance, adjustable editing workspace, easier media management, key frame video, improved Magic tools, and 3D slide shows with beat detection. Overall, Cyberlink’s PowerDirector 7 is an affordable video-editing suite for families and beginners that can grow with them as they become increasingly more experienced. CyberLink Power Director 7 combines its popular automated editing and video enhancement tools with more advanced editing options, with professional results. Power Director 7 provides consumers with professional high-definition video support throughout the capturing, editing and production, though to disc authoring. 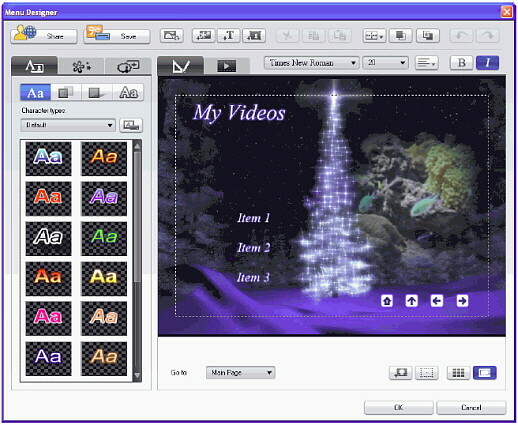 The PowerDirector 7 interface makes video editing for the beginner as simple as rolling down a hill, especially for home users who expect good results quickly and with a minimum of fuss. This software includes the "magic" automated tools, and sharing options through portable devices like (Sony PSP) and the Web (YouTube). To make an informed decision before you buy. Throw yourself completely into the creative process with PowerDirector 7 advanced features and time line tools. Improvements to usability puts the joy back into digital video editing. 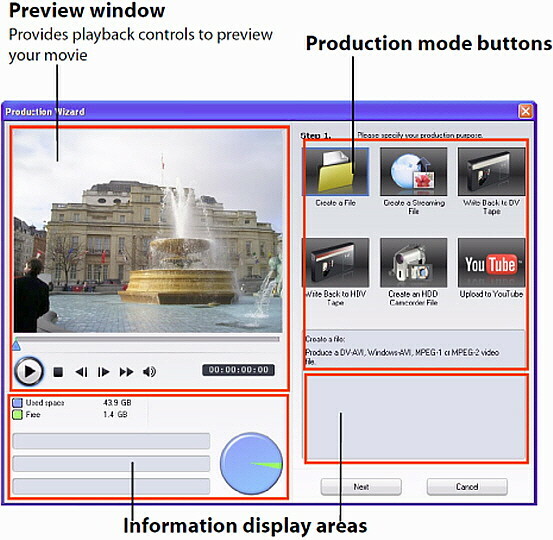 PowerDirector 7 create impressive animations, chroma-key effects, and masks, with up to 6 tracks of picture-in-picture objects. Select from our library of PiP graphics, or import a photo to create your own animated overlays. PowerDirector 7 design's unique animations by setting the key frames for effects and object animations. PowerDirector 7 creates dramatic shots to highlight people, objects and moments in your videos. Add text directly on the screen or animate your shot to intensify the emotion even more. Take your disc production to a new level of sophistication. Include menu navigation that gives the option to play all scenes or make a scene selection. You can move buttons, include animated chapter thumbnails, even import images as backgrounds. The designs you create can be uploaded to DirectorZone to be shared with other creators. Add video subtitles by importing .TXT or .SRT files, or manually typing in the Subtitle Room. You can imprint subtitles directly on your video to appear like captions, or set them as a selectable feature on your output DVDs. Turn your time code and date stamp into a subtitle on your video (requires DV or HDV camera to support this feature). Different from time codes saved during the capturing process, PowerDirector allows you to disable (hide) your time code subtitle at any time before final production. Supports the display of EXIF information for photos too. Change your workspace to suit your working style. Drag on your media libraries, the timeline, and preview window to give you more space to create. Adapt the way you access photos, videos, and effects to your working style. Organize your media by creating new sub folders to sort and store photos and videos. Save your library for future use, or load an existing one for your new project. Display your project content by name, duration, file size, date or type. View the details of your files, instead of thumbnails. Enjoy being more productive. You'll find importing photos and videos, and accessing effects libraries and DVD menu templates, is now quicker than ever. PowerDirector supports all kinds of content sources, including HDV camcorders, TV tuner cards, Blu-ray Discs, DVDs, webcams, CDs, and more. Authoring discs is one of the best ways to preserve your home movies; now you can store high-definition AVCHD content too. Support for Blu-ray Discs gives you even greater capacity for your high-definition videos. PowerDirector adds the final pro touch to your discs with its built-in authoring tools for Blu-ray Discs and DVDs. Get your movies online fast with direct uploading to YouTube. With easy steps you can name and tag your video so you are easily found by millions of viewers online. Produce movies that you can watch everywhere via iPod, iPhone or PSP. Output files are optimized in a size and resolution that plays best for each device. Camcorders don't just record, they are an extremely convenient way to connect to a TV, PC monitor, or projector, so you can show your movie to others. PowerDirector lets you write your finished movie directly back to your camcorder. Make an informed decision before you buy. 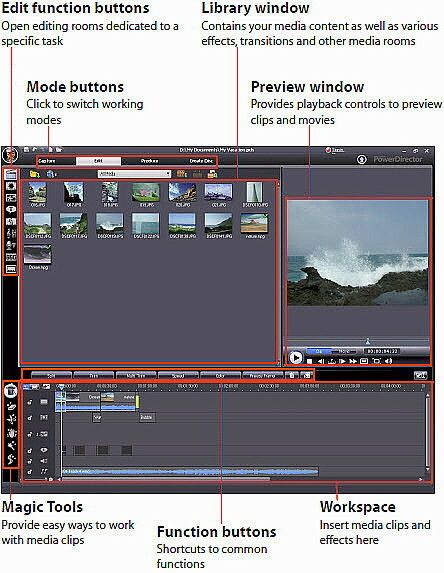 PowerDirector's Magic Editing tools are a great way to edit and enhance your video projects. These powerful features automate many functions you might expect from professional video editing software yet still provide options for fine-tuning your results. 12 popular themes let you automatically edit your movie, add effects, and insert a title and credits. Particle effects, alpha-blended PiPs, and slick transitions are inserted according to the style of your selected theme. Create complete movies in minutes using PowerDirector's step-by-step approach to movie production. Select your content source, your music, a theme, and duration, then the wizard does the rest. Video editing software has never been this easy. PowerDirector 7 Stabilizes shaky videos with even greater precision and check results with the convenient split screen preview. 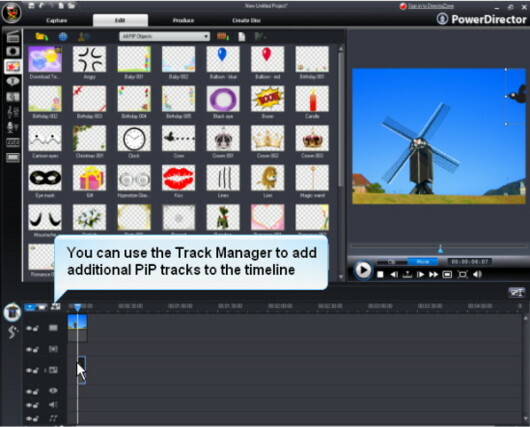 Movie editing software PowerDirector analyzes your video to decide which sections of your project need most improvement. Animate photos with PowerDirector's 21 pre-set motion templates, or customize by setting your own motion path. Apply the same template to all your photos with just one click. PowerDirector 7 ensures all your precious moments are able to be seen by eliminating the effects of bad lighting. You can apply multiple enhancements at once to fix these common problems: low lighting, extreme backlighting, poor white balance, inaccurate colors. Keep your best footage and cut out the rest automatically! Video editing software PowerDirector 7 does the thinking for you. PowerDirector 7 creates a quality soundtrack that automatically syncs with the duration of your video. HD video editing software PowerDirector now ensures your photos can look like movies too, with easy-to-apply animation effects. 3D, highlight, motion, cell, collage, scrapbook and normal offer cool ways to turn photos into a movie. PowerDirector's 3D engine creates a classic 3D room-like effect. You'll be amazed at how stunning photo slideshows can be. Change the order and position of individual photos with the cell slideshow style. Automatically sync your photos to display to the beat of your music. Change the music and you instantly change the mood of your slideshow.